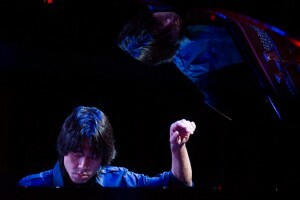 Taka Kigawa performed the complete solo piano works of Pierre Boulez on Monday at Le Poisson Rouge. A hall helps create the impression of a piece of music almost as much as the player or the piece itself. It is doubtless largely because the pianist Taka Kigawa’s recital on Monday evening was held at Le Poisson Rouge, the basement club in Greenwich Village, that his program had such a bewitchingly suave, intimate effect. Yes, implausibly enough, the complete solo piano works of Pierre Boulez sounded, in Mr. Kigawa’s hands and with the low-ceilinged Le Poisson Rouge acoustics, glasses tinkling at the bar, like nothing so much as a collection of unusually experimental cabaret music. Lest I give the impression, though, that Mr. Kigawa was just another anonymous cocktail pianist, I should emphasize that he was far from an innocent bystander on Monday. The gentleness of so much of the music, even its coziness, was his decision as much as a consequence of the space: an approach to this famously — even infamously — exacting music that valued warmth and variety of texture, with a tone less stark and white than what many musicians bring to it. To hear all these works in a single concert — all together lasting two hours, with intermission — was truly to feel immersed. From the kaleidoscopic “12 Notations,” composed in the mid-1940s, to the eerie reverberations of “Une Page d’Éphéméride” (2005), by way of the three sonatas and “Incises” (1994), the music seemed to unravel in a single grand expanse. Mr. Kigawa emphasized the consistency of Mr. Boulez’s style across time, giving the lie to some who have commented on a more sensual, less arduous feel in the later works. The recital answered strongly: His piano music has always been sensual, and it’s never been particularly arduous to listen to. But it’s true that it can be hard to find traction within the music: Rigorous in construction, it often comes across in performance as capricious and even improvisatory. Mr. Kigawa embraced the changeability of Mr. Boulez’s catlike motifs, which creep and echo until they suddenly quiver or jump, and he wove them convincingly into larger structures. The “Notations” cast a particular spell. Brief — each of the 12 is just 12 bars long — and piquant, they offered Mr. Kigawa a full range of moods and effects: violently sliding in the second, elegiac in the fifth, rumbling and distant in the ninth. He conjured a whole world by following a pristine, glassy note with a velvety one in the first movement of the Third Sonata, which Mr. Boulez, now 89 and ill, began in the mid-1950s and which may well be destined to remain unfinished. In the Second Sonata (1947-48), which made its composer’s international reputation, Mr. Kigawa played with a surprisingly mellow tone, relishing the resonances. The big chords in the slow second movement were moist, not dry, and, later in the work, even crashing clusters of notes were juxtaposed with small moments of startling delicacy. The sonata’s ending remains one of the most gorgeous things Mr. Boulez has written, a quiet section of still, solemn beauty gradually spreading out into space.